I am happy to announce that, today, I registered the domain name reasonsharvest.com. That domain’s temporary home page will be replaced over the coming weeks as I approach an as-yet not determined launch date. However, in what follows, I provide a little background about why I have registered the site. Reason’s Harvest is a holiday which I founded and first celebrated on November 23, 2007. My intention and hope is that it be celebrated by rational people world-wide, annually, on the first Friday following the U.S. Thanksgiving Thursday. In 2008, Reason’s Harvest will be celebrated on November 28, 2008. Reason’s Harvest is celebrated by both earning as much as one can earn on that day by honest, rational activity and spending ones own earnings on things one rationally values more than the money paid in exchange. The purpose of the holiday is to celebrate reason (humankind’s sole means of obtaining knowledge of the facts of reality) and rationality. By focusing upon the production of material values, and upon trading them for things valued even more, each individual uses Reason’s Harvest not only to pursue his or her own happiness, but to do so conspicuously, as a demonstration to others both of the purpose of ones life (to pursue ones own happiness), and the virtue of rationality. In the process, productive creation by means of rational human thought and action is championed and rational producers/creators are admired. The spirit of Reason’s Harvest is summed up in a holiday greeting I have created for Reason’s Harvest: “Go Thank Yourself!“. It is a greeting that recognizes that each person is responsible for his own happiness such that, if one achieves happiness, one has oneself to thank (and, usually, only oneself to thank). 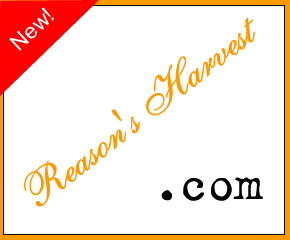 In the weeks and months leading up to the celebration of Reason’s Harvest in 2008, the newly-registered reasonsharvest.com web site will be developed into a more contemporarily-styled one, offering ideas and products to help you maximize your enjoyment of Reason’s Harvest this year and in all future years. As just one example, I hope to make available for purchase a Reason’s Harvest tee-shirt identical to the one I wore on the first celebration of Reason’s Harvest (November 23, 2007). In the meantime, please bookmark reasonsharvest.com and forward the URL to all of the rational individuals you know. Your ideas, and theirs are welcome and encouraged. Let’s make Reason’s Harvest a great – and conspicuous – one in 2008. Wouldn’t it make more sense to spend the money the next day? I mean, if I’m trying to work as much as I can on a particular day I probably would have to work overtime. Well, keep in mind that Reason’s Harvest happens on the same day that the eco-fascists and communists want everyone to “buy nothing”. I’m with you all the way Paul, I was just semi seriously considering a practical aspect.